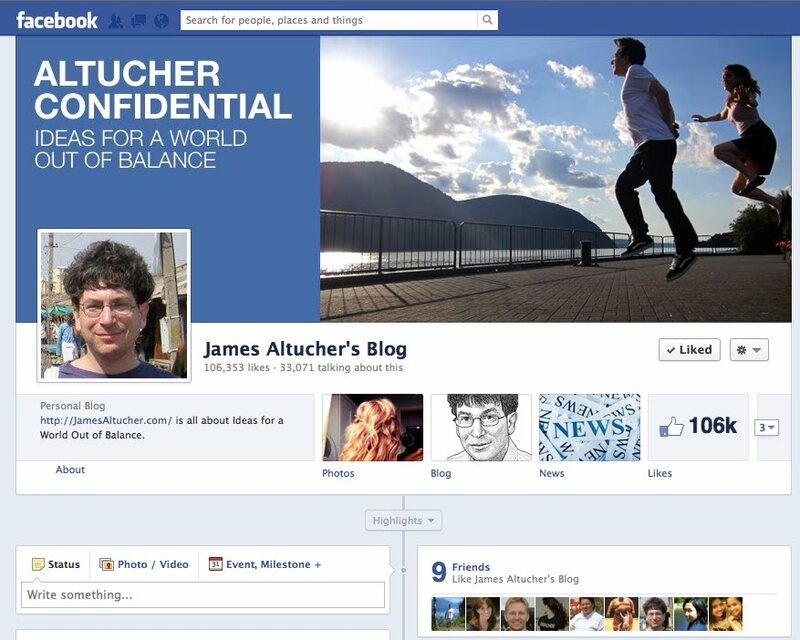 Editor’s note: James Altucher is an investor, programmer, author, and entrepreneur. He is Managing Director of Formula Capital and has written ten books. His latest books are I Was Blind But Now I See and 40 Alternatives to College. 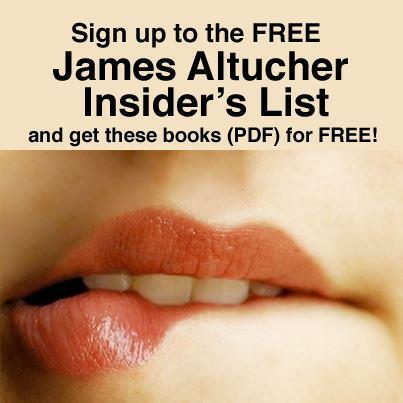 You can follow him on Twitter @jaltucher. I wanted to have 100,000 Facebook fans for my blog. I don’t have a product to sell. I’m not trying to get advertisers on my blog. I’m not even trying to get more speaking gigs because of my blog. But I believe in the message of my blog and I enjoy having an audience for it. So I wanted to expand that audience. We have entered the “Choose Yourself” era. No longer do you have to wait for the big media companies to reach down from the heavens and bless you with a column, a book advance, a TV show, a job, a career, money, or even customers. In 2008 the tide came in, the financial system collapsed, and we saw that the myth of corporate safety was just another example of the brainwashing that we had undergone since we were kids. Now, if you want to spread the truths of your brand, of your ideas, of your products, of your message, you have to create your own platform, you have to spread it across all media, and then you have to manage each medium differently. I can’t just link my blog posts on Facebook. Or tweet links to my posts on Twitter. Your message has to be spread across the entire digital landscape and treat each medium as its own channel, with your message, formatted, designed, and massaged to have the greatest impact in that particular channel. For each medium, you have to ask: why this medium? For Facebook the answer is obvious but is so different from prior media that most people don’t think about it. In general, if you want a fan (or a customer) to “Like” you even if he has never heard of you, you are going to have to pay to reach him. BUT, on Facebook, as opposed to any other medium (other than twitter) you pay ONCE and then forever after you can market to that Fan for free. You can’t do that with TV, for instance. Budweiser has to reach the same fans each year with another $4mm commercial. But on Facebook, once they are a fan, then anything you post goes on their newsfeed for at least three hours. More on that in a second. So here’s what I did. It was a three step process. Here’s my Facebook fan growth in the month that I pursued this. It basically took about 30 days to get 100,000 fans. Just to experiment, I then tried a slightly smaller approach on my wife’s very popular yoga blog and she went from 0 to 37,000 fans during those few weeks. While there will always be some churn in Fans, it is much smaller than you would think. It’s relatively rare for people to Like and then un-Like. 1) Many people around the world have no idea who I am (this is hard for me to accept but it’s reality). Even though I get a lot of readers to my blog, these were not the people I necessarily wanted to reach. I wanted to reach new people who didn’t know me. This made my fan page not only a source about my own blog (which most of the seven billion people on the planet could care less about) but a source for the top trending stories at any given moment for Innovation, Inspiration, Healthy Lifestyle, and Entrepreneurship. Then, even if someone was not interested in me, they could still Like my page and always know they can come back to see these top trending stories in their favorite topics for any moment in time. FanNewsCast could then make ads targeting people interested in these topics. 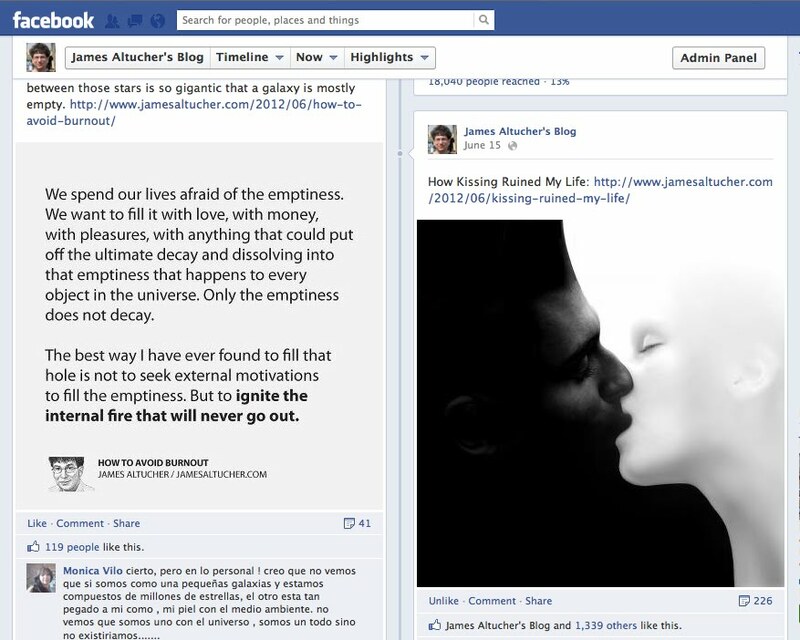 So then I would know that there was a high likelihood these same people would also like posts coming from jamesaltucher.com. Then, FanNewsCast came up with ads that targeted the friends of people who were already connected to my blog but specifically not the people connected to my blog. I made FanNewsCast an admin on my ads and they developed the ads. Essentially, it reached all the friends of friends of my blog, which means they targeted millions of people. The ads would point to the tab pages that included the top trending stories about inspiration, entrepreneurship, etc because they knew people would be interested in these stories. They also worked with the agency I hired (see #3) to help them update my page three times a day with the best material I have. 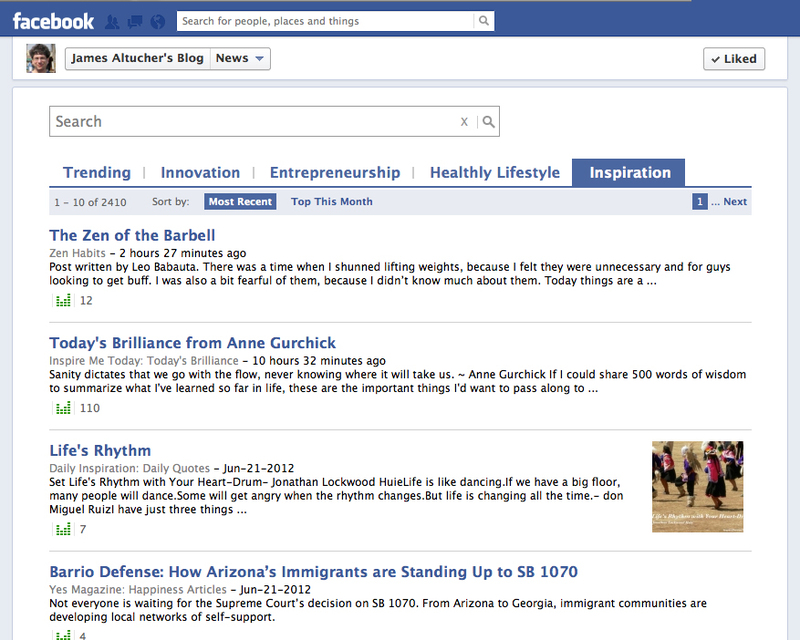 Each of those friends of friends would see “XYZ Likes James Altucher’s Blog” in the ad, where XYZ was someone already connected to my blog. This is sort of like dating. If the woman’s friend already approves of you before you even meet the woman, you’ve already overcome a major hurdle. Exact same principle. These ads were mostly CPC ads. Using this approach got me to the first 50,000 Fans. Overall, I ended up paying about 7 cents per click (because friends of friends of friends would start seeing their friends like my fan page and so they would then Like it so I was getting, in some cases, greater than 100% returns). – They set up a mobile ad campaign which got me mobile users. The clickthru rates on ads were as high as 90% on some of their ads. It is much more effective to advertise to a mobile user. They also found demographic data differentiating the iPhone users (who clicked through at a much higher rate) and the Android users and were then able to optimize the ads to target them more efficiently (“efficiently” means “cheaper and faster”). – I wanted to bring down my cost per click even lower. And I was hungry for speed. Optim.al determines what words in an ad, in general, causes people to click and causes people to “Like”. So they started putting together ad campaigns that used those words. Then they would do a lot of testing: putting the words in the front of the ad, in the back of the ad, linking to specific posts on the page, linking to the whole page, experimenting with different pictures in the ad, etc. They also changed my ads for structured settlements from CPC to CPM to bring cost down since they were specifically optimizing and targeting the type of people who would click on a CPM ad. Each ad campaign probably had four or five separate factors they were testing and they would start new campaigns each day. Within hours they would drop the ads with slower and more expensive click-thrus and up the budgets on the ads that were working. In the last few days before I hit 100,000 I was adding 10,000 fans per day probably at a cost of 3 or 4 cents per Like. – Right now they are doing more geo-targeting so I pick up Fans from specific cities. Like New York City. They have optimized which approaches work best for each city. Targeting a specific city is more expensive but now with my first goal achieved I’m taking my time and experimenting more with what works. I am fine, in general, with all English speakers. This is in part because I am not selling a product but I believe in my specific message and ideas and I like to get those ideas across to anyone who will listen. Altogether, I’ve probably had less than 1/10 of 1% unlike my page during this process (I wrote at first, “unlike me”. Freudian slip or perhaps too close an identification with my social media persona as opposed to who the real me is). Why an image as opposed to a link to my blog? One reasons is I want the page itself to be its own channel for me and not just an extension of my blog. The other reasons was that I wanted to improve my “edgerank” score. Facebook tends to favor images, text, links in that order when deciding what to put on a user’s fan page. Links are last because they would prefer people not leave the site. So I wanted to be seen by as many fans as possible so more people would be “talking about” (commenting, liking, or sharing) my “story”. This, in turn, increases my edgerank further. It becomes a virtuous cycle. A lot of theSocialPag.es work also involved A/B testing. Was it better to post an image or text? Was it better to have an image with text or a more artistic image? What time of day, etc. They worked closely with FanNewsCast and optim.al to figure all of this out. They also then set up an email subscription service for me using Mailchimp. Again, I’m trying to use the Fan page as it’s own channel but to also interlink with all of my other channels. The outcome of posting a signup image on my Facebook fan page for the email service was that I got a quick few thousand signups, mostly from the US. So regardless of where most of my “Fans” were coming from, it was quality users responding to an offer. They then would pin all images to my Pinterest boards. They also took the results from my Twitter Q&A posts and would update Quora questions with them. Again, they took every channel and updated it for me. I also use them for technical maintenance on the blog along with the guys from Stocktwits, who host my blog. Everyone who is saying “Facebook will eventually die just like Myspace” simply doesn’t understand Facebook and how it has already gone so far beyond a tipping point there is no turning back. Facebook is a scrubbed-clean mini-Internet that will soak up large ad budgets that were intended for mainstream traditional media. But examples like mine shows that it won’t. – Many bloggers will apply the strategies outlined above. Why not? You can do it at your own pace and at your own budget. In fact, if you want to be a part of this “Choose Yourself” era you will have to do it. Similar to the reasons why one should self-publish a book on Amazon, or participate on G+ and twitter and even China’s Weibo (where I have an intern helping me maintain my “presence” and engagement there). Nobody is going to choose you until YOU choose you. – Facebook continues to roll out new ways to advertise. Not only for mobile, which is fairly new but now I can promote more individual posts. When you post on your fan page it will hit, on average, 16% of your audience. This has always been the case. But now, with a small budget of $10-$50 you can make sure your post will hit up to 75% of your audience or even more. I had one post exposed to over a million people because of the Shares. Both of the posts in the above image, I separately promoted. This applies for any page with less than 100,000 Fans. Once you hit 100,000 fans there are other techniques but similar budgets. And I haven’t even begun to scratch the surface of what I could do with my page. I feel like it’s TV in 1955. The entire world is open to me. What other medium can I potentially target a potential 700 million people (as one of my ads targeted) in an ad with a budget as low as $200. Altogether, my entire ad budget over the last month was about $6000. Then maybe $2000 more for the maintenance and upkeep. The ad budget includes also promoting individual posts, which I didn’t need to do to get more fans but I used to get more engagement. I feel like I’m just now beginning to fly with this fan page.